Growing Up Disney: Photo Flashback - Happy Wedding Anniversary!! Amy and DisneyDad. 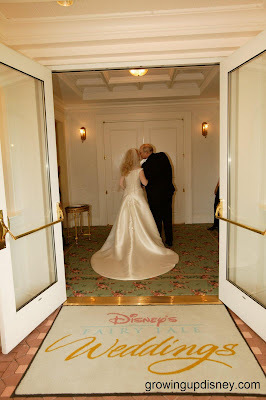 ---- One last kiss from Dad just before I escorted her down the aisle. 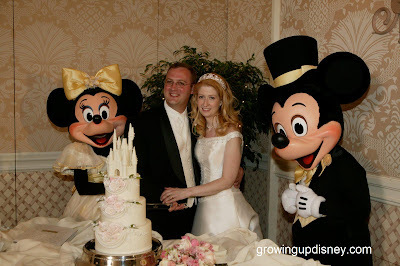 I surprised Amy & Andy with two friends to help them cut their cake. These are two of my favorite memories from Amy & Andy's wedding. It was an absolutely beautiful wedding. I can't say enough good things about Disney's Fairytale Weddings. They did an absolutely wonderful job in putting everything together. What do you buy? Paper, Clocks, MUST be something WDW themed. Wow it's been a whole year for the Blogoversay. Thanks for letting me be apart. (note I HAD to use something you wrote on my own blog today). Have thoughts on Sunday meet up, will email. Need to check on hours first.